BlueSeventy tossed the mold and rebuilt this suit faster, stronger, and worthy of the weekend warrior. Every aspect of this suit is designed for high performance without sacrificing comfort. 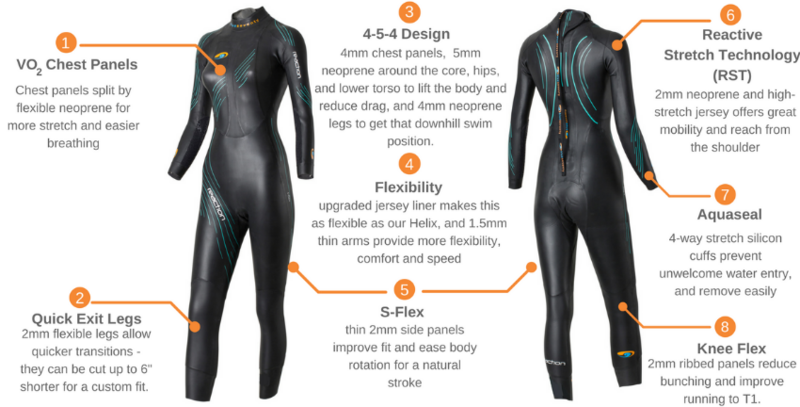 Since its introduction in 2006, Blueseventy Reaction Women's wetsuit are helping more athletes accomplish their goals than any other wetsuit. Proven RST panels paired with over-sized high stretch arm gussetts allow unrestricted reach in the water. The finest Japanese-sourced full 39 cell Yamamoto neoprene creates superior buoyancy and delivers enhanced flexibility throughout the entire suit. The Slippery SCS coating reduces drag. The low neckline and VO2 chest panel create a suit that optimizes energy and swims as fast as it looks. A new upgraded jersey liner in the upper body allows for unrestricted reach. The Reaction benefits from 2mm thin Side Panels that begin under the arm and end at the knee. This technology improves fit and body position in the water without sacrificing buoyancy. The Reaction tiers buoyancy 4-5-4 by centralizing core buoyancy to raise the position of the hips in relation to the rest of the swimmer. Two chest panels of 4mm accentuate natural lung buoyancy to optimize upper body position relative to the legs. 5mm neoprene supports the hips and lower torso, lifting the body in the water, reducing drag and improving speed. 5mm panels in the back of the hips are laterally orientated in order to facilitate raised body position when you roll to the side during breathing. New 2mm lower legs panels deliver faster transition splits. The Reaction wetsuit proves to be one of the best women's wetsuits on the market today. HEIGHT (ft/in) 4'7" -5'1" 4'10" - 5'3" 5'0" - 5'5" 5'3" - 5'9" 5'3" - 5'9" 5'6" - 5'11" 5'7" - 6'0" 5'7" - 6'0" 5'7" -6'0"